This hygrometer is designed to take quick measurements of the environmental conditions. To do so the hygrometer measures humidity and temperature. In addition to that it is also possible to determine the wet bulb temperature as well as the dew point temperature which allows the elimination of fungus in food storage, as well as in food transportation. 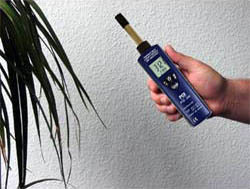 It is also very useful in the construction industry to determine condensation in walls. Thanks to its solid design, this hygrometer is ideal for taking measurements on site, so long as the humidity sensor is not touched, manipulated or placed directly into liquid as it is a very sensitive component. The fast measurements that can be made with the hygrometer make it a very handy device to estimate the environmental conditions in very different fields of application. For further information on the hygrometer, please read the following technical data or call our hotline: UK customers +44(0) 23 809 870 30 / US customers +1-410-387-7703. 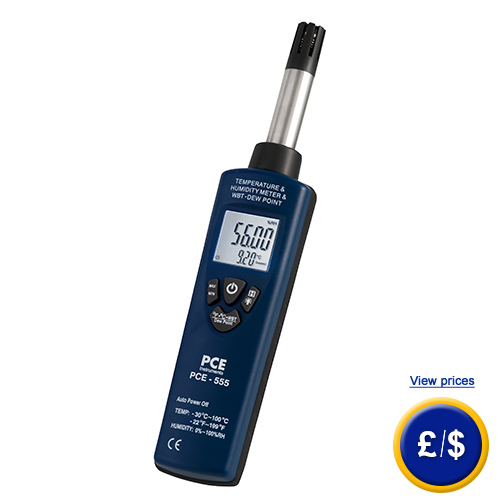 Our engineers and technicians will gladly advise you with the hygrometer or any other device in the field of measurment instruments, laboratory equipment, regulation and control or scales and balances of PCE Instruments. Outdoor use of the hygrometer. Indoor use of the hygrometer. Dry bulb temperature is simply the environmental temperature. It's the temperature that is measured using any kind of thermometer. Wet bulb temperature is determined by using a mercury thermometer which is situated in the shade with the bulb covered with a piece of wet fabric under a current of air, measuring, for example, a vent or a rotating electric fan. This way, the evaporation of water absorbs heat lowering the temperature, reflecting the decrease in the temperature reading. The lower relative humidity is, the quicker the water in the fabric will evaporate and the further the resulting decrease with respect to the dry bulb temperature (this is used to give an idea of thermal sensation). Dew point is the temperature at which air vapour turns into condensation, producing dew, mist or frost if the temperature is low enough. 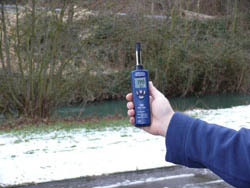 If we pay attention to the wet thermometer temperature (wet bulb temperature), the same wet bulb temperature is always obtained with different temperature and relative humidity combinations: for instance, the same wet bulb temperature is obtained 10 ºC for 20 ºC and 23 % RH or for 15 °C and 52 % RH, as well as many other combinations which are shown in the table for humidity meters. This fact is very important for the operation of conditioning installations due to the fact that the air which is located can be converted into one state or another without power supply. Taking into account an air mass at 20 °C to 23 % RH and transforming water in water vapour without any external power supply, relative humidity increases at the same time that temperature decreases owing to the evaporation cold. All the states obtained during the evaporation process are near the line of the constant wet bulb temperature: at 52 % RH a 10 °C temperature is reached. These changes are called adiabatic and are valued in the conditioning technique.